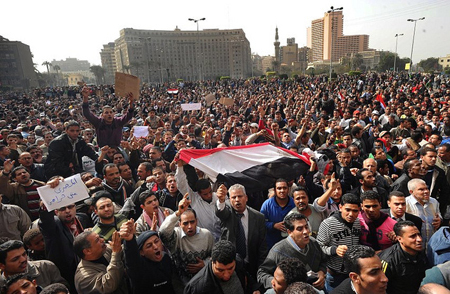 January 27, 2011 — The revolt spreading from Tunisia to Algeria, Egypt, Yemen and beyond inspires both hope and fear. Hope, because so many tens of millions of people are taking to the streets at the risk of beating, torture and death to liberate themselves and their country. But also fear, because of the chilling reality that for every democratic victory — such as we’ve witnessed so far in Tunisia, or the fall of the Berlin Wall in 1989 or the political revolution that ended South African apartheid – there’s also the specter of the bloodbath of Tiananmen (Beijing, 1989), Kwangju (South Korea, 1980) or Iran and Burma of the past couple of years. The Bureau of the Fourth International has issued a statement, In Tunisia and Egypt the revolutions are underway. On the background of the upheaval in Tunisia as well as Algeria and its potential direction, Merip Reports Online. A recommendation from the longtime Israeli militant Moshe Machover, “to follow events in Egypt, go to the website of the leftist blogger Hossam el-Hamalawy.” His Twitter page can be found here. which obviously speaks about their own situation but which, I think, reflects some of the spirit in the streets of several countries at this pivotal moment. Nonetheless the spirit of revolt spreads, sometimes like an underground fire in the wake of defeat. The roots of Egypt’s present uprising were laid in a semi-clandestine social-media network of solidarity with a textile workers’ strike in Mahalla, brutally crushed two years ago. The rage of young people who graduate from school with no jobs intersects with that of the 40% of Egypt’s population living just at or below the United Nations $2-per-day “absolute poverty” level – where one blogger reports that people wait for the penny-a-loaf bread to be sold the next day at half-price – and the anger of the middle class over pervasive corruption and the blockage of any meaningful political options. Commentators have long noted that popular frustration in Arab countries is a “powder keg,” to the point where the warning is a commonplace. But we can safely state that no one predicted that the new wave of revolt would begin in Tunisia – which seemed to be a safe and stable authoritarian ally for U.S. interests and “the war on terror” (i.e. imperialism), with Islamist and leftist oppositions weak and in exile – let alone with the self-immolation of an individual, nonpolitical young street vendor who had been stripped of his future, his means of livelihood and finally his dignity. President Barack Obama, in the State of the Union message, intoned that the United States “stands with the people of Tunisia, and supports the democratic aspirations of all people.” What a crock. In the interests of basic decency, the president would have done better to say nothing – at a moment when the U.S. government blocks Jean-Bertrand Aristide’s return to Haiti, supports a coup-installed regime in Honduras and as we know from WikiLeaks, connives with the president of Yemen to cover up American drone attacks. In fact, nothing threatens “American interests” in the Middle East more seriously than the eruption of democracy. Without the Egyptian regime enforcing Israel’s blockade, the people of Gaza would not be kept at the edge of starvation. Even more, the threat of democracy tears the veil off the utter cynicism of imperialism’s Middle East strategy, which has always relied on ruling-family potentates to control “our” oil supplies and on presidentialist dictators to control impoverished populations. Thanks again to WikiLeaks, the world knows that these very regimes, bitterly alienated from their own people, are the ones secretly pleading for the United States to attack Iran. When George W. Bush proclaimed “the democratic transformation of the Middle East,” it was rightly regarded as an obscene gesture to the region. In contrast, early in president Obama’s administration when he issued his message of friendship to the Muslim world in Cairo, he enjoyed tremendous credibility. Two years later – by pursuing the ruinous war in Afghanistan and Pakistan, maintaining the Guantanamo prison and allowing the government of Israel to openly mock the U.S. administration’s feeble pleas to halt settlement building – Obama has largely burned through his reservoir of political capital in the Arab and Muslim world. 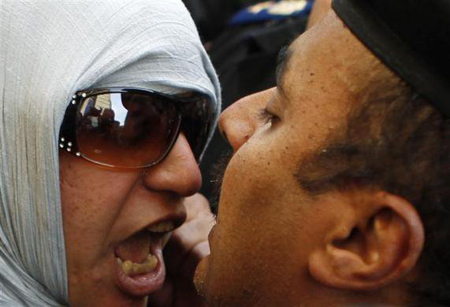 It is absurd right now to predict the outcome of the struggle in the most pivotal of all Arab countries, Egypt. Everyone today understands that Washington’s appeal for the Mubarak regime “to respect the Egyptian people’s right to peaceful expression” is a desperate attempt to substitute superficial change from above for the sweeping and fundamental regime change that the people are demanding. 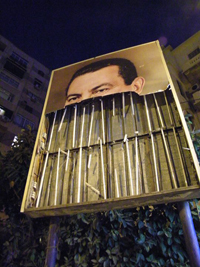 Whether that demand will be crushed for the time being, or whether the regime will offer some concession, or – what seems impossible, but also seemed impossible in Tunisia until it happened – Mubarak will follow Ben Ali into political oblivion, is an open question. This crisis also coincides, of course, with the leaked Palestine Authority documents showing (if it weren’t already clear) that the “peace process” is a giant fraud; with a political upheaval in Lebanon that could fracture that country and/or present a pretext for another Israeli invasion; and with a deepening impasse between the United States and the Iranian regime. The U.S. left, above all those of us who are socialists and dare to dream that winning the “democratic aspirations” of the people in Tunisia and the Middle East is the first step toward the birth of a revolutionary socialist movement there, must present a clear answer to the elite warnings of “the democratic danger:” Power in the hands of the masses is the solution, not the problem. Democracy is the power of people to reshape their own societies in the interests of the vast majority, over those of the local ruling classes and the multinational corporations and the pirates of international finance. Whether the democratic insurgency in the Maghreb and beyond today achieves or falls short of its “democratic aspirations,” it has changed the realities on the ground in ways that were unthinkable only a few short weeks ago. Nothing will be the same again.